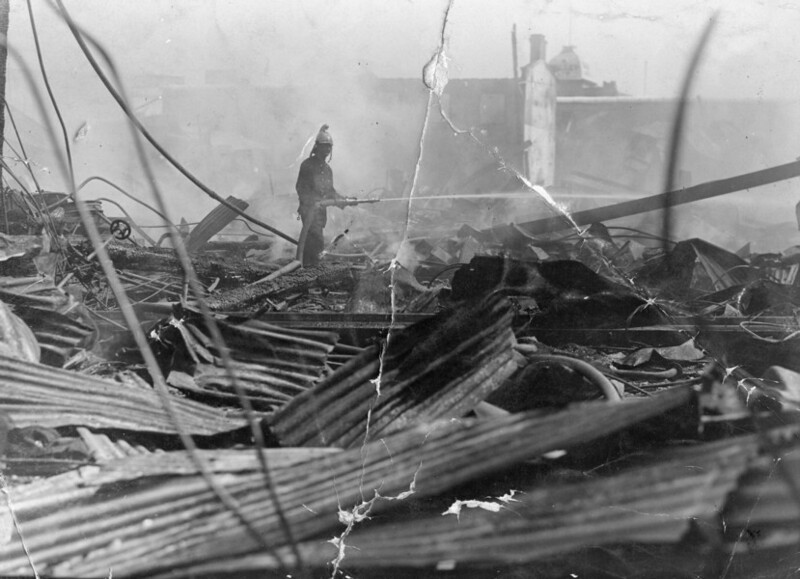 Duncan & Fraser's Franklin Street factory on fire, 21st February 1923. This is believed to be "The Advertiser" photographer before the roof collapsed. Photo courtesy SLSA PRG280/1/41/180. For hundreds of years one of the greatest threats to human life and property has been fire, for example The Great Fire of London in 1666. This threat was never more real then with the advent of the Industrial Revolution and the application of steam. Unfortunately the rapid rise of steam generation and the application of steam power grew at a faster rate than our methods to extinguish fires. This threat was very real in Colonial Adelaide. Some of Adelaide's famous local companies to suffer devastating fires were John Martins, Colonial Sugar Refinery, Port Adelaide Flour Mills, Lion's Timber Mills, J.& D. Fowlers, Burford's Soap Factory but to list a few. When you add the devastating bush fires of "The Adelaide Hills Bush Fires" of 1939, "Black Sunday" of 1951 and "Ash Wednesday" in 1980 one can still understand the huge fire risk we still face and manage even to this day. Duncan & Fraser Limited were not excluded from this list. 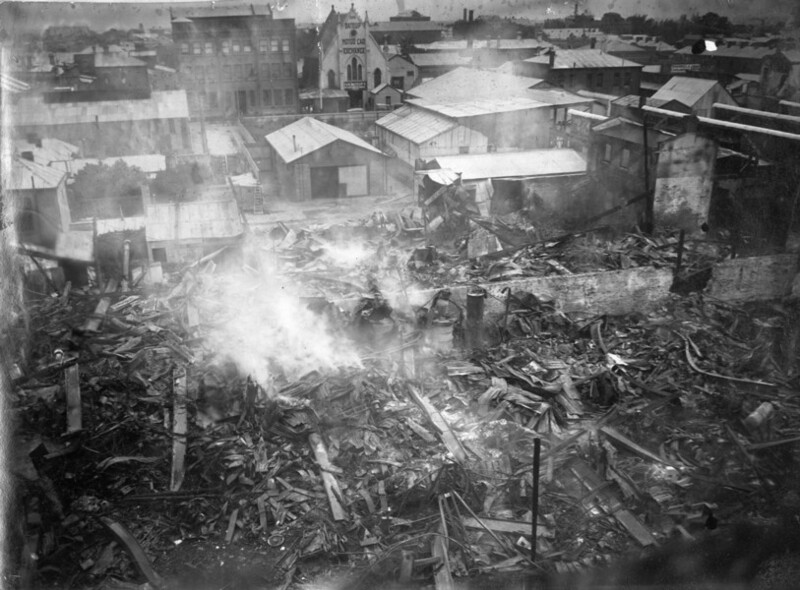 The fire of February 1923 was Adelaide famous as being the largest fire of the day. It wasn't until the publication of "Legacies Left Untold" that it was found that Duncan & Fraser Ltd. escaped another factory fire years earlier, but it was extinguished before it took hold. On this page we will look at the fire at the factories of Duncan & Fraser Ltd. in greater detail. 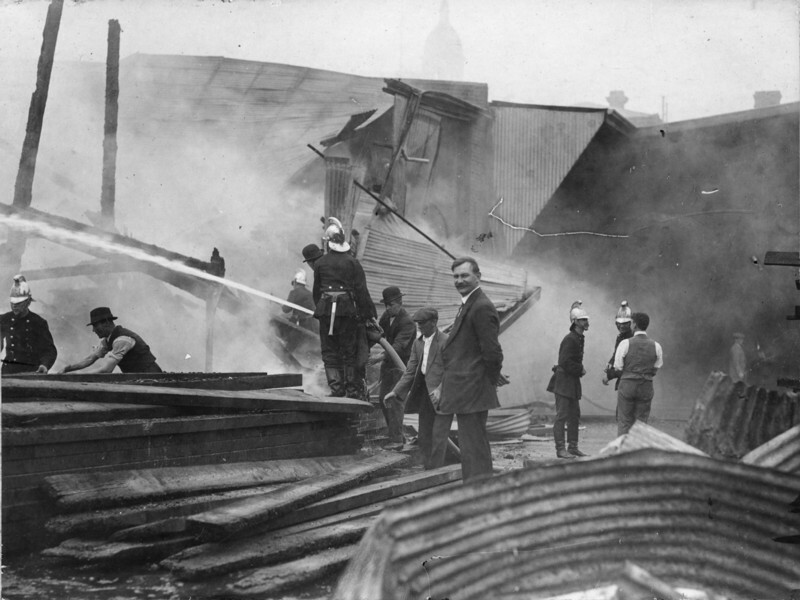 Details are very sketchy, but around April 1919 a fire broke out in the workshop area of Franklin Street. An employee saw the fire start and and was quick to respond. The fire was extinguished before it could take hold in one of the most flammable parts of the factory. Apparently only minor damage was sustained and all was repaired by the end of the day. A single reference to a "First Fire" initially surfaced in late 2009, a year or so after "Legacies Left Untold" was published. I was excited to find a new, but previously untold piece of the Duncan & Fraser story. Specific research is continuing, but any further information has proven to be elusive to say the least. I have found no mention of it in the "SA Motor" nor "The Register" or "The Advertiser" newspapers. In Adelaide the summer of 1922-23 was another scorcher. Tuesday 20th February 1923 was another extremely hot and dry day with the temperature reaching nearly 110°F in the shade. The people of Adelaide were seeking the cool shade, the ice for the meat safes was melting faster than it could be delivered. The final day of a 4 day Sheffield Shield test cricket match between South Australia and Victoria being played at Adelaide Oval was drawing to a close with South Australia losing by 7 wickets. Around 6 pm Robert Duncan walked the floors of the factory. Some of the Duncan family had a birthday to attend as Keith Duncan was celebrating his 23rd birthday. "Good Night! See you tomorrow!" At 6 pm the last of the employees were leaving for the day. After tidying up a few things James Newell Duncan also said "Good Night" and went home for his grandson's birthday. About 9 pm Robert checked the premises for the final time of the day and handed things over to the Night Caretaker and the Car Washer. Robert then retired for the night as he had done for many years so many times before. The two night employees of Duncan & Fraser Ltd. & Duncan Motors Ltd. had an uneventful night. As first light started to appear, Adelaide was waking up to another expected scorching hot day. Mr. Fenn, the night caretaker was asleep in his room at the back of the factory. Mr. Coumbe, the car washer had started at 10pm and had finished his work. Around 5.45 am he was washing up to go home in readiness for "knocking off" at 6 am. Mr. Fenn & Mr. Coumbe were the only people actually inside the factory when the fire broke out. Police took statements on the day of the disaster and luckily both their statements to the police have survived. We can begin to understand what actually happened as the fire took hold inside the factory. "I am employed as a caretaker by Duncan and Fraser Ltd. and Duncan Motors Limited at their premises at Franklin Street Adelaide. 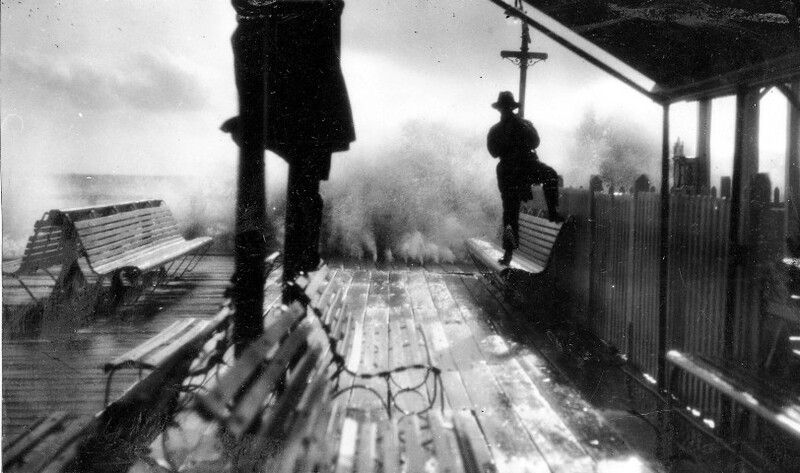 At about 5-45 a.m. on the 21st of February 1923 I was awakened by a cracking of wood and glass. I immediately got out of my sleeping room and I could then see that the factory was on fire in the north eastern corner, adjoining the premises occupied by the South Australian Farmers Co-Operative Union at the corner of Bentham and Franklin Streets Adelaide. I saw that the flames were spreading rapidly, I rushed to the telephone to call the Fire Brigade but I could not get into communication with the Central Telephone Exchange, I then hung the telephone receiver up and rushed and opened the garage door to raise the alarm and as soon as I reached the street I saw the Fire Brigade reel coming up Franklin Street in the direction of the factory. The Brigade almost immediately began to fight the flames. I called to the night car washer man (Coumbe) to run out and save what cars he could from the garage. With Coumbe’s assistance I removed two cars from the garage into the Street, the Police then prevented Coumbe and myself from removing any more of the cars on account of the danger and that it interfered with the operations of the Fire Brigade. I next went to the General Post Office and telephoned my employers and informed them of the of the fire. 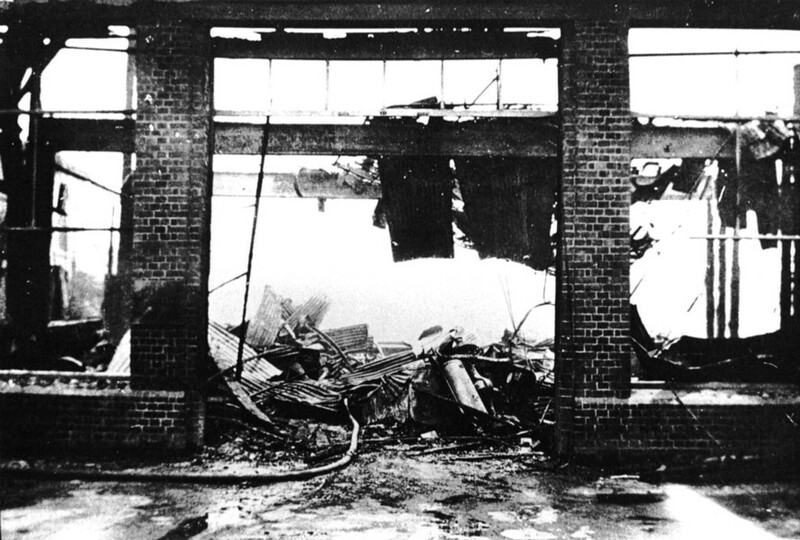 When I returned to the factory the whole of the premises were well alight and practically everything in the building, with the exception of a portion of the garage near Waymouth Street was destroyed. Mr. Robert Duncan and other directors of the firm of Duncan and Fraser Limited and Duncan Motors Limited were soon on the scene of the fire. The room I use for sleeping quarters is on the ground floor. The fire started on the second floor. I have no idea how it originated." "I am employed as a motor car washer by the firm of Duncan and Fraser Limited at their factory at Franklin Street, Adelaide. I always work from 10 p.m. until 6 a.m. on the following morning. I commenced work at 10 p.m. on Tuesday the 20th of February Inst. At about 5-45 a.m. on the 21st of February 1923 I was engaged putting a motor car on the stand ready to wash it, I left it and went to change my clothes ready for knocking off work at 6 a.m. Whilst I was changing my clothes I heard cracking sounds as if stones were being thrown on to galvanised iron. I immediately ran out into Franklin Street and I then saw that the factory was on fire, the top story appeared to be well alight and it seemed to be confined to the north eastern corner of the premises. 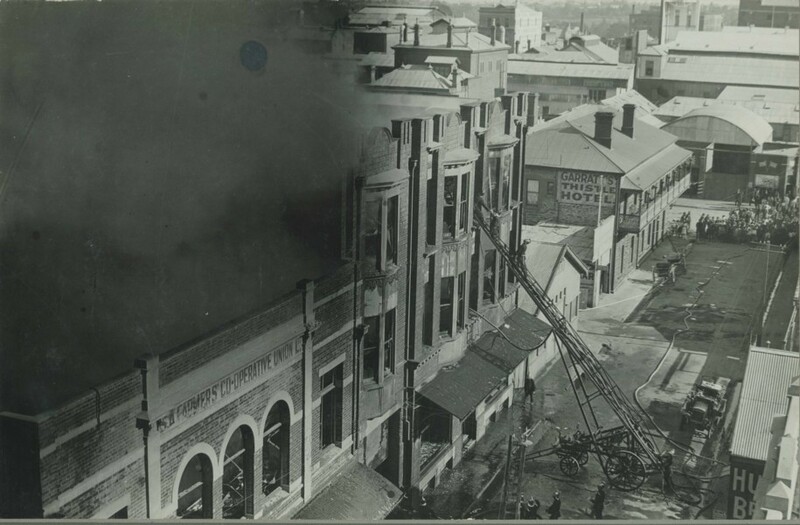 I could see that the fire was beginning to reach the premises of the South Australian Farmers Co-Operative Union at the corner of Bentham and Franklin Streets Adelaide. I ran inside and informed Mr. Fenn the caretaker of the fire and I met him running towards the big door of the motor garage. I next got my clothes and assisted to remove two motor cars from the garage to the Street. I was then stopped by the police on account of the danger of going into the burning building, and also because of interference with the operations of the firemen. 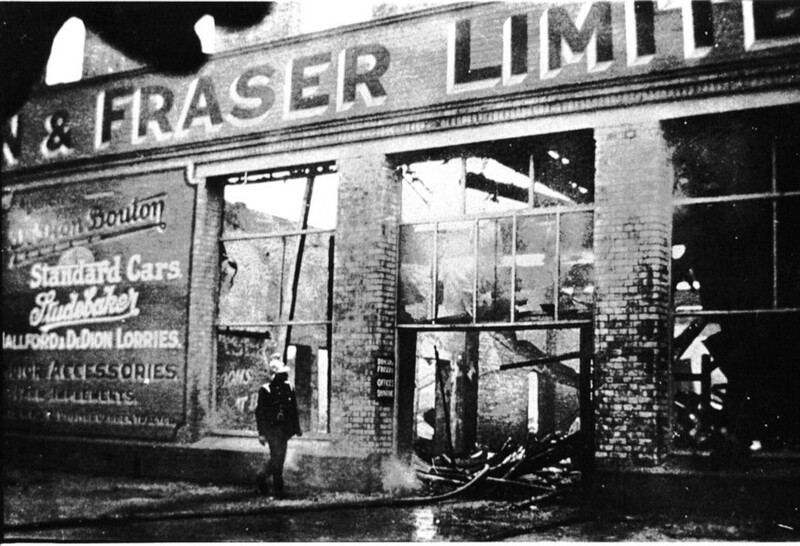 I do not know how the fire started and it appeared to have a good hold on the second floor of the premises of Duncan & Fraser Ltd."
Police Constable Thorsen was walking east along Currie Street he noticed a pall of heavy black smoke rising in the direction of Franklin Street. He rushed to the Currie Street alarm and immediately telephoned the fire brigade. It was 5.40am, Wednesday 21st February 1923. At the end of his shift PC Thorsen lodged this statement with the sergeant of watch. I was on duty in Currie Street, Adelaide, at about 5-40 A.M. on the 21st February 1923, when I saw heavy black smoke rising from a building in Franklin Street. I immediately rang up the fire brigade from the Currie Street alarm. I then proceeded to Franklin Street were I saw that the factories of Duncan and Fraser Ltd. and Duncan Motors Limited were on fire. The fire brigade had already commenced to fight the flames. The fire appeared to be burning worse in the north eastern corner of the building and was commencing to attack the premises of the South Australian Farmers Co Operative Union Limited at the corner of Bentham and Franklin streets. Shortly after I arrived at the fire, there were three explosions in Duncan and Fraser's Factory and these explosions were followed by added fierceness of the flames. 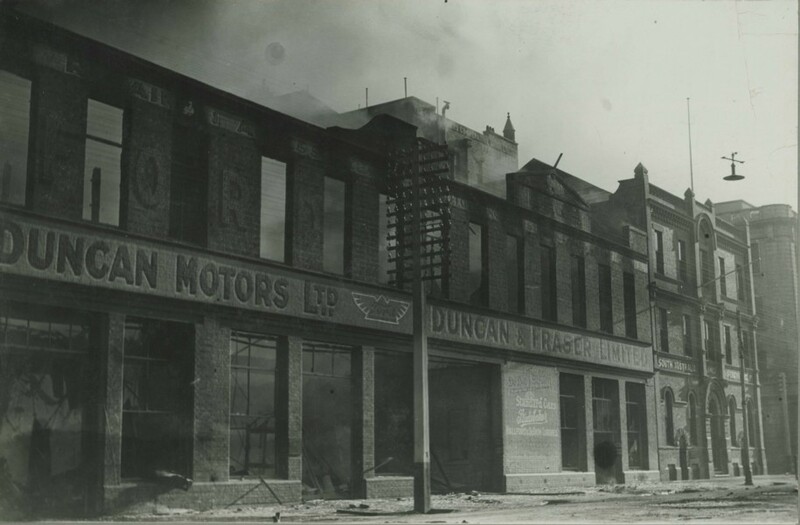 When I first reached the scene of the fire it appeared to be confined to the second floor of Duncan and Fraser Ltd. and Duncan Motors Limited and it did not appear as if the ground floor was then burning." “The first intimation that anything was wrong was a muffled explosion shortly after the time mentioned, and almost immediately a thin tongue of flame was seen issuing from the center of Duncan & Fraser’s vast building like a pennant. Within a few moments this had spread into a great expanse of flame, and smoke was ascending like a huge black plume. The fire spread rapidly once it had attained a hold, and the greedy flames licked ravenously at the inflammable materials. Two shattering explosions were heard as far a field as Henley Beach and Burnside, and thereafter there was not a vestige of hope for the doomed building or the greater part of its contents. The breaking of the windows provided plenty of draft and the flames were soon roaring and leaping in a very inferno of raging heat. One of the first to notice the fire was Constable Thorsen, who gave the alarm, and the fire brigade arrived on the scene shortly before 6 am, but it was obvious even then that it would be impossible to save the building. The firemen immediately forced an entrance and endeavored to get the motor cars out on the road. They were successful in saving 6 new Studebaker cars and the number of Ford cars, but when the explosions occurred the main roof of the building fell in and it was impossible to do anything more in the way of salvage. Thereafter the firemen, who had gathered in strong force, devoted their efforts to saving buildings in the vicinity and in this way they were helped by the fact that there was little wind blowing. What breeze there was blew in the direction of the fireproof building of the Farmer’s Union, who have to thank their automatic sprinklers for the fact that their Franklin Street frontage showed no damage. Their hardware and machinery sections, however, suffered severely, and at one time it looked as if the fire would obtain a hold on the main building itself. Despite the early hour the crowds soon gathered, but the presence of troopers and foot police who were quickly on the scene kept them from crowding and hampering the difficult work of the firemen. The fire presented a magnificent spectacle as the flames broke through the roof and the windows of the second story of Duncan & Fraser’s premises. The smell of the burning paint and varnish was overpowering, as scores of fine cars were devoured, and there was an ever recurring series of explosions as the flames reached the petrol tanks of the various cars. Gas cylinders were said to have exploded long before the crowd reached the spot, but the knowledge that there must of necessity be a big quantity of petrol on the premises inspired them with a healthy regard for their safety, which made the work of the police much easier. The firemen seemed utterly oblivious of the danger, and scores of helmeted figures could be seen in the blazing building clambering about, and gesticulating the orders which could not be heard for the tremendous roar and crackle of the fire. The whole scene was a veritable devil’s barbecue, with property worth fully £130,000 as the feast. In this connection it maybe mentioned that 13 new Studebaker cars, which were delivered to the firm on Tuesday, and 44 Ford cars which were awaiting delivery, were devoured in a few moments by the flames. There was a great danger for the firefighters, and one fireman is reported is to have had his leg badly burned. By 9 am it was all over. The official company brass plaque tarnished by extreme heat some how survived and was still affixed to the front wall. The main passageway from the front now led to a twisted mass of smouldering debris of iron and steel. The great bevelled glass doors, once a feature of the building, were burnt from their hinges. Not a single pane of glass remained of the beautiful plate glass windows which had run 140 feet along Franklin Street. The building, covering nearly an acre of ground, had been totally destroyed in an almost incredibly short space of time by one of the most disastrous fires known in South Australia. Hugh Duncan took his 3½ year old son to see the last embers being extinguished. He can still see the fire hoses strung in all directions in Franklin Street. That boy, James Playford Duncan is now 91 years old (in 2010) and still remembers the morning vividly. Amazingly 8 cars had been saved and thankfully there was no loss of life. The first of 3 previously unpublished photos taken by an employee watching in the crowd. The firemen are still watching the smouldering embers and fire hoses are still inside extinguishing spot fires. Clearly seen are the twisted remains caused by the intense heat. Photo courtesy of Alan Wallace, AM. The second of 3 previously unpublished photos taken by an employee watching in the crowd. The employee was able to get a photo looking directly into the factory of Duncan & Fraser Ltd. through the main double doors on the far eastern side of the factory. 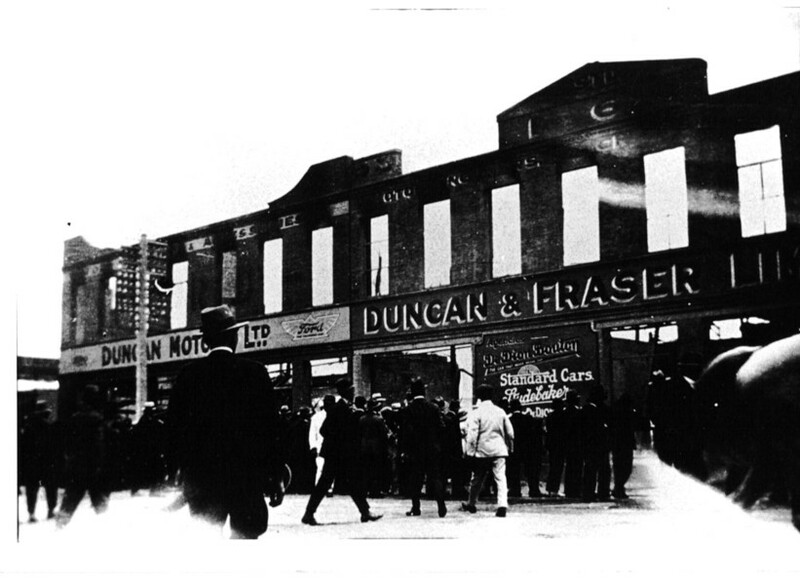 The total devastation of Duncan & Fraser Ltd. and Duncan Motors Ltd. can clearly be seen. The third of 3 previously unpublished photos taken by an employee watching in the crowd. Sadly this photo clearly shows the morbid curiosity we all display with the huge crowd of onlookers that gathered to watch the spectacle. 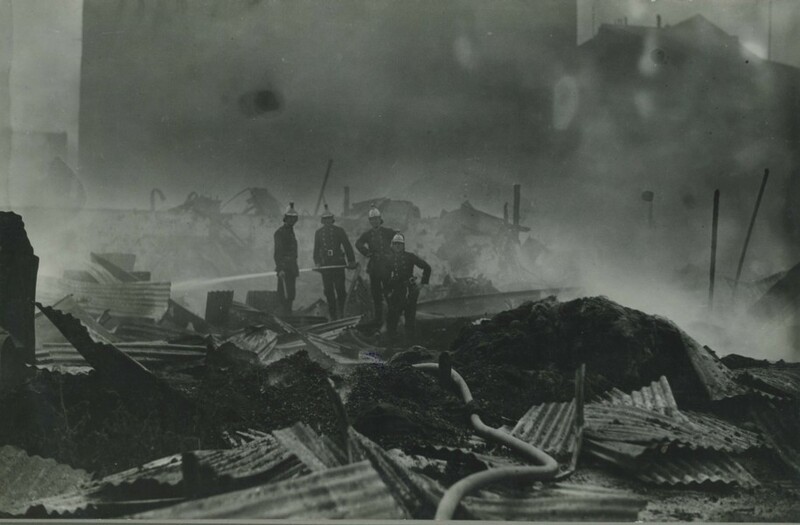 The fire had rapidly taken hold and started burning the adjacent property of the SA Farmer's Co-operative Union Ltd. This photo is taken from the Darling Buildings looking north down Bentham Street towards another gathering crowd in Waymouth Street. Note the fireman on the ladder fighting the fire through the windows. This photo is the first of three that was rescued from the bin after being thrown out from a local company's boardroom upgrade. Photo courtesy of Karol Stadulka. This photo was taken after the fireman had packed up. Clearly seen are the remains still smoldering from the heat. The fire started in the area behind the top right hand window adjacent to SA Farmers Co-op building. The fire spread and damaged some of their premises too. This photo is the second of three that was rescued from the bin after being thrown out from a local company's boardroom upgrade. During the fire the main roof weakened and fell down. 13 new Studebaker and 44 new Fords were just a small part of what was lost. This photo is the third of three that was rescued from the bin after being thrown out from a local company's boardroom upgrade. Another view of firemen extinguishing the embers. The twisted mass of steel and rubble was all that remained of the factory. Volunteers are now on site assisting to stack wood and other items. Photo courtesy of State Library of South Australia PRG280/1/40/48. In the distant background the unusual top of Adelaide's iconic Tolley Building situated in Waymouth Street can clearly be seen through the smoke haze. Damaged original print. Photo courtesy of State Library of South Australia PRG280/1/40/48. They say a picture is "...worth a thousand words..."
An ariel view of the still smouldering ruins of the once mighty 2 storey factory complex that covered over an acre totally destroyed on the morning of Wednesday 21st February, 1923. This extraordinary view was photographed probably for insurance purposes from the top of the Franklin Street facade looking north towards Waymouth Street. The remains of the Duncan & Fraser's and Duncan Motors' strong rooms and the SA Farmer's Co-operative Union Ltd. buildings are just out of view on the right. Despite the destruction of the factory, the workshop that can be seen just to the right of the centre with the flat type of roof survived virtually unscathed with nealry all the customer's cars being saved. This wonderful photo is courtesy of State Library of South Australia PRG280/1/36/19. The official police statements make very interesting reading about the ensuing investigation. All sorts or questions were raised at the time specifically whether the cause was accidental or deliberately lit. Sadly misinformed speculation and rumours quickly spread around Adelaide. However, as one reads the reports it is easy to see that the cause was established as nothing more sinister than a simple electrical fault emanating in the upstairs part of the factory near the industrial sewing machines. The Eagle Star & British Dominion Insurance Company was satisfied with these findings so much so that they agreed that a coroner's enquiry would not have to be held and almost immediately released funds to assist with rebuilding. Do you have any more information on these events? Have you an old photograph(s) hidden away in those old, dusty family albums? Do you have anything pertaining to either Duncan & Fraser Ltd. or Duncan Motors Ltd.? perhaps a relative that worked for the South Australian Farmer's Co-opertaive?